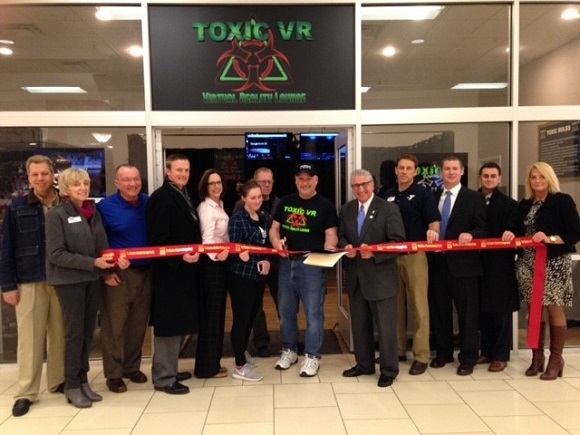 Today we celebrated the grand opening of Toxic VR Virtual Reality Lounge located inside Clifton Park Center, Clifton Park. Come experience the state of the art experience in virtual reality with large dedicated play areas. Travel the world, paint a masterpiece, or just have some fun with awesome arcade games. There is something for everyone! from YMCA Southern Saratoga County Branch and Chamber Ambassador; Brian White from Saratoga National Bank & Trust Co. and Chamber Ambassador; Nick Zarrelli from Saratoga National Bank & Trust Co.; Lisa Rice from Bouchey & Clarke Benefits, Inc. and Chamber Ambassador.